New low-light sensor technology from Kodak could virtually eliminate the need for using flash with digital cameras and cameraphones. 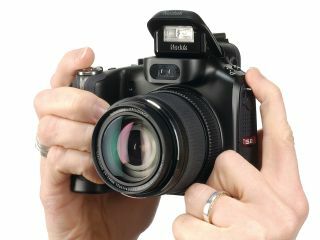 The Kodak sensor technology increases sensitivity to light significantly, according to reports . It uses a new arrangement of light-sensitive pixels in the image sensor to capture more light, Kodak claims. Regular image sensors on digital cameras conform to the 'Bayer Pattern' - a split of red, green and blue pixel image sensors to capture an image. After exposure, these image elements are then reconstructed and processed to form a colour digital image. The new Kodak sensor technology adds "clear" pixels to the red, green and blue pixels on the sensor. This enables it to capture a greater proportion of the light. So it's possible to shoot good quality images in far lower light conditions than has previously been possible. Manufacturers interested in using Kodak's new low-light imaging technology will be able to see it in action in early 2008, Chris McNiffe, general manager at Kodak Image Sensor Solutions, reportedly said . However, there's no timeframe yet for seeing it implemented in commercial products such as digital cameras or cameraphones.